What's New on Prof Joel Hayward's Website (2017)? 2015: It is not my intention to continue providing professional updates. 12 February 2014: The Arabic newspaper, Al Ittihad, published an article on me, focusing on my new book on air power and ecology. The article can be read HERE. 11 February 2014: The Arabic language newspaper, Al Khaleej, published an article on me, focusing on my new edited book on air power and the environment. The article can be read HERE. 11 February 2014: The English language UAE newspaper, The Gulf Today, published an article on me and my book. The article can be read HERE. 15 December 2013: Added to this website a free PDF for readers of my 2013 edited book, Airpower and the Environment: The Ecological Implications of Modern Air Warfare (Air University Press, 2013. ISBN: 978-1-58566-223-4). It took two years to gain vindication and the apology that the Islam-intolerant Mail on Sunday / Daily Mail owed me for libelling and slandering me so badly, but I finally got my apology and the Mail had to pay my legal costs and a substantial sum in damages. The Mail can bury its apology far from the front page and try to pass it off as a minor matter, but its apology and payment of costs and personal damages represent a major loss. "On 7 and 8 August 2011 we suggested that the beliefs of Dr Joel Hayward, then the Dean of the RAF College Cranwell, prevented him from fulfilling his duty of impartiality and fairness as a teacher in the RAF by causing him to show undue favouritism to Islamic students and spend too much time on Islamic activities. We now accept that these allegations are untrue. We apologise to Dr Hayward and have paid a substantial sum to him in damages." I wish to thank my tenacious and skilful libel lawyers, the brilliant Carter-Ruck of London, for the masterful way in which they pursued justice and vindication for me. 23 June 2013: Appointed Chair of Humanities and Social Sciences at Khalifa University. 18 May 2013: Published Warfare in the Quran in HRH Prince Ghazi bin Muhammad, Ibrahim Kalin and Mohammad Hashim Kamali, editors, War and Peace in Islam: The Uses and Abuses of Jihad (Amman: Royal Islamic Strategic Studies Centre / Royal Aal al-Bayt Institute for Islamic Thought, 2013), pp. 28-56. 6 December 2012: Mourned the passing of Dr Vincent Orange. "In our article entitled "RAF pilot converts to Islam" we suggested that the beliefs of Dr Joel Hayward, the Dean of RAF College Cranwell, prevented him from fulfilling the duty of impartiality and fairness imposed upon him as a teacher in the RAF, that officer cadets were in fear of saying anything that Dr Hayward might construe as 'anti-Muslim', and that he was giving too much time to his Islamic activities that were nothing to do with the RAF. We accept that these allegations are untrue and apologise to Dr Hayward." 11 November 2012: Commenced work as a Professor of International and Civil Security at Khalifa University in Abu Dhabi. 8 November 2012: Lectured on "Islam, War and Peace" at Faizan-e-Madina Masjid. 2 November 2012: Lectured on "Prophet Muhammad's Campaigns in the Light of Modern Military Ethics" at the Faculty of Divinity, University of Cambridge. 19 September 2012: Gave the Eighth Annual SACRE Lecture: "The Compatibility of Western and Islamic Values". 4 September 2012: Part 2 of "The Journey" published in The Invitation, August-September 2012. 5 August 2012: Taught on the Journey through the Quran course held at Queen Mary University of London by the Islamic Institute for Development and Research (IIDR). 7 June 2012: Part 1 of "The Journey" published in The Invitation, June-July 2012. 15 April 2012: Kube Publishing released Splitting the Moon: A Collection of Islamic Poetry. It can be purchased HERE. 15 January 2012: The prestigious Royal Islamic Strategic Studies Centre in Amman, Jordan (affiliated with the highly respected and influential Royal Aal al-Bayt Institute for Islamic Thought), published my new monograph, Warfare in the Quran. 1 January 2012: Commenced a Senior Fellowship at the Markfield Institute of Higher Education (The Islamic Foundation). 22 December 2011: The Invitation (November-December 2011 issue) published my poem, "Beyond". 14 November 2011: Emel column, Saudi Women and the Arab Spring, appeared in print (Emel, Issue 86, November 2011). 13 November 2011: New article, "Remembrance Sunday: Commemorating Sacrifice and Suffering", published on The Platform, the website of the Muslim Council of Britains (MCB) Youth Affairs Committee. The original (unedited) version of this article can be read HERE on my own website. 10 November 2011: Contributed to John ODoherty's Financial Times article on military airlift, "Military transport: US prepares to lose its lead on the heavy lifters ". It can be read HERE. 12 October 2011: Emel column, Leave Libya's Future to the Libyans, appeared in print (Emel, Issue 85, October 2011). 5 October 2011: Had an article, "Politics, Faith and Morality," published in Al-Hidayah Magazine, Volume 1 No. 2 (September 2011), pp. 23-27. 24 September 2011: I was very honoured to draft the text of this important Declaration (http://www.londondeclaration.com) for Minhaj-ul-Quran and Shaykh-ul-Islam Dr Muhammad Tahir-ul-Qadri. The London Declaration (http://www.londondeclaration.com) will only prove influential and beneficial if it becomes widely quoted (and taken to heart) as a statement of good will between faith and cultural communities. For this to occur, we must circulate it to all our friends and contacts and invite them to sign it. I respectfully ask you please to do this. 15 September 2011: Emel column, Here's Hoping, appeared in print (Emel, Issue 84, September 2011). 9 September 2011: Contributed to a BBC Asian Network radio programme on the effects of 9/11. 25 August 2011: New article, "Any Rush to Help Libya Should be Balanced by Realism and Commonsense," published on The Platform, the website of the Muslim Council of Britains (MCB) Youth Affairs Committee. 23 August 2011: My poem, "The Six at Thawr," was recited on New York radio station Radio Tahrir (99.5fm) at 2100 and streamed online at wbai.org. The programme has also been made available as a podcast through its own website, http://www.RadioTahrir.org. The sound file can be heard HERE (the poem starts at 38.45 minutes). 15 August 2011: Gave a lecture on comparitive ethics of war at York St John University. 14 August 2011: Published an article, "The Right Man for the Right Time, on the Emel website. 2 August 2011: Had a poem, "The Six at Thawr," published in Damazine: The Literary Journal of the Muslim World, Summer 2011, p. 6. 27 July 2011: Emel column, A Mixed Bag, appeared in print (Emel, Issue 83, August 2011). 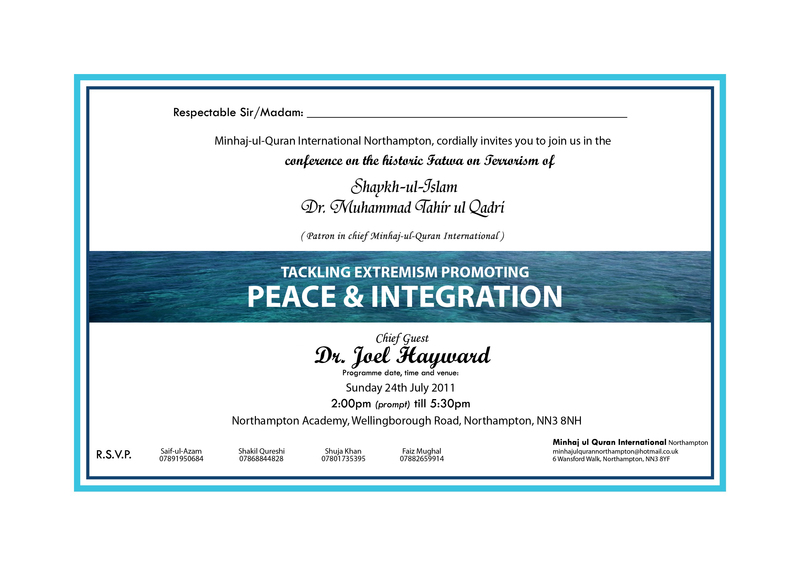 24 July 2011: Gave a public lecture, "Islam, Radicalisation and Terrorism" at the "Tackling Extremism Promoting Peace and Integration" conference at the Northampton Academy. See the brochure HERE. 23 July 2011: Gave a public lecture, "Western and Islamic Values: Why Do They Current Seem to Differ?" at the Karimia Islamic Camp (run by the Karimia Institute), Hollowford Centre. 11 July 2011: Emel column, Don't Hold Your Breath, appeared in print (Emel, Issue 82, July 2011). 11 July 2011: New article, "It's Not as Clear-cut as It Seems," published on The Platform, the website of the Muslim Council of Britains (MCB) Youth Affairs Committee. 10 July 2011: Gave a BBC Radio interview on Islam and terrorism. The sound file is available HERE. 22 June 2011: Gave a public lecture: "The Ethics of War: An Islamic Perspective," Explore Islam Lectures 2011, Staffordshire University. 21 June 2011: New article, Al-Qaedas Leadership: Imposing our own Cultural Views? published on The Platform, the website of the Muslim Council of Britains (MCB) Youth Affairs Committee. 31 May 2011: Had a poem, "Zuhr Prayer in Peterborough," published in Contemporary World Literature, Issue Seven (May/June 2011). 27 May 2011: Had a poem, "The True Wealth," published in The Muslim News. 23 May 2011: Emel column, Time for Reflection, appeared in print (Emel, Issue 81, June 2011). It can be read HERE. 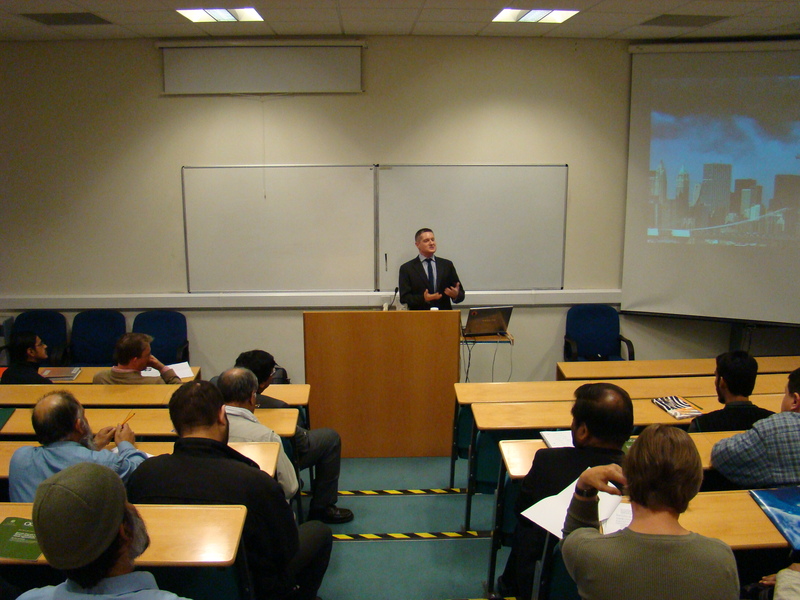 18 May 2011: Gave a lecture, "The Challenges for Muslims in a British Military Context," at the excellent Markfield Institute of Higher Education. A photo can be seen HERE. 16 May 2011: The Invitation (March-April 2011 issue) published my article, "The Value of Restraint". 7 May 2011: Contributed today to a fascinating conference / workshop: "Can You be British and Muslim?" Staffordshire Muslim Youth Council Conference, Staffordshire University. it was superbly organised and the teenagers were a joy to work with. 5 May 2011: Did a live BBC Asian Network radio interview today (with public phone-in) on the subject of Afghanistan's relationship with the US in the wake of Osama bin Laden's death. 26 April 2011: Emel column, The Need to Tread Carefully, appeared in print (Emel, Issue 80, May 2011). It can be read HERE. 19 April 2011: Peer-reviewed Occasional Paper published: "Quranic Concepts of the Ethics of War: Challenging the Claims of Islamic Aggressiveness," Cordoba Foundation Occasional Paper (Series 2, April 2011). 4 April 2011: Review of James S. Corum, Wolfram von Richthofen: Master of the German Air War (University Press of Kansas, 2008), published in English Historical Review, No. 126 (April 2011), pp. 501-502. 24 March 2011: Peer-reviewed article published: Reflections on the Maxwell Revolution: John Warden and Reforms in Professional Military Education [with Israeli scholar Dr Tamir Libel], Air Power Review, Vol. 4, No. 1 (Spring 2011), pp. 11-33. 20 March 2011: Interviewed on BBC Radio Manchester on the subject of my voluntary work for Minhaj-ul-Quran. The sound file is available HERE. 14 March 2011: Appointed as Strategic Policy Advisor to Shaykh-ul-Islam Dr Muhammad Tahir-ul-Qadri and the Minhaj-ul-Quran organisation, a moderate multinational organisation which aspires to enhance the wellbeing of all humans through humanitarian aid and development, religious moderation, opposition to extremism, accessible and enriching education, and dialogue based on mutual respect between the worlds great faith communities. Urdu-language article available HERE. Widespread coverage in the subcontinent included many Urdu newspapers as well as The Nation and Pakistan Today. 11 march 2011: Invited to join the Think Africa Press Board of Experts. 11 March 2011: Interviewed today for Think Africa Press about the generic complexities of initiating and conducting no-fly zones. 25 February 2011: Contributed today to a fascinating counter-radicalisation workshop in Sheffield organised by the Muslim Youth League. The audience was excellent: police representatives, councillors and educators. 25 February 2011. Emel column, Evolution is often better than Revolution, appeared in print (Emel, Issue 78, March 2011). It can be read HERE. 21 February 2011: Did a live BBC Asian Network radio interview today (with public phone-in) on the subject of Muslims fighting for HM Forces in Afghanistan. The production team and host were excellent. 21 February 2011: Today BBC Asian Network radio broadcast its excellent documentary, "Muslims on the Frontline," to which I was honoured to contribute. Click to listen. 17 February 2011: Lectured today at York St John University on the subject of the Qur'anic concepts of justice and war. The audience comprised both Christians and Muslims (including Serbs and Kosovars). The audience dynamics were fascinating. 13 February 2011: Posted off new article for Al-Hidayah magazine: Politics, Faith and Morality: The Complexities of an Awkward Relationship. 5 February 2011: Had a poem, "Today's World," published in The Invitation. 27 January 2011. Emel column, Much Ado about Nothing, appeared in print (Emel, Issue 77 February 2011). It can be read HERE. 15 January 2011: Shaykh-ul-Islam Dr Tahir-ul-Qadris Fatwa on Terrorism and Suicide Bombings, containing my Introduction, appeared in print. A free downloadable pdf of the fatwa is available HERE. 31 December 2011: Peer-reviewed article, Air Power, Ethics and Civilian Immunity during the Great War and its Aftermath, has now been published in Global War Studies, Vol. 7, No. 7 (2010), pp. 102-130. It is posted here with the editor's kind permission. Please read the copyright statement on its first page. 31 December 2010. Emel column, Free Speech isnt always Pleasant, appeared in print (Emel, Issue 76, January 2011). It can be read HERE. 18 December 2010: Addressed the Armed Forces Muslim Association at its belated Eid celebration, alongside General Sir David Richards, Chief of the Defence Staff. My topic: Islam, War and Justice. 11-16 December 2011: In Jakarta, Indonesia, with the Indonesian Defense University and the Indonesian MOD. 10 December 2010: Had a poem, "Knees of a Revert," published in Al Mu'min. 6 December 2010: Enjoyed doing a two-hour phone-in ("talkback") interview on Radio 103.1 FM. The topics ranged from the fatwa on terrorism to the Qur'anic concepts of war and justice. The interviewer was very good. 1 December 2010: New peer-reviewed article, "The Qur'an and War: Observations on Islamic Just War," has now been published in Air Power Review, Vol. 13, No. 3, pp. 41-63. 20 November 2010: Did a long and very in-depth television interview for the Ummah Channel on the topic of Islam, war and justice. 23 October 2010: Gave a keynote lecture in London at the massive Global Peace and Unity (GPU) Conference on the topic: "War & Ethics: The Compatibility of 'Western' and Islamic Thought".